French photographer Eric Lafforgue’s photograph of a man from the Kikuyu tribe of Kenya captures the spirit of a culture whose traditions persist in the face of an ever-globalizing world. As the largest ethnic group in Kenya, the Kikuyu people make up about 17% of the country’s population. Although they traditionally adhered to an indigenous faith, most Kikuyu people today are Christians. 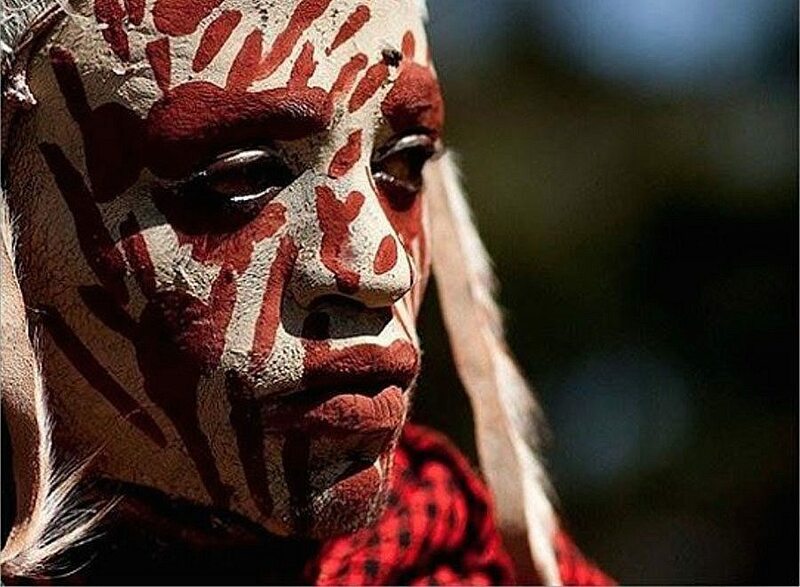 This image of a man with his face painted in red ochre, an integral part of the tribe’s rituals, festivals, and hierarchical displays, displays the tension between the desire to maintain tradition and the inescapability of global, popular culture. His steadfast expression invites the viewer to contemplate the value of indigenous groups in modern society. The man’s face paint and headdress are such a strong focus of the photograph that they assume the role of the subject. The white background acts as a canvas and the red ochre patterns mimic abstract brush strokes. In this way, the face paint becomes a highly prized work of art, a beautiful cultural creation with the same amount of value as a western painting in a museum. The red ochre ornaments the body, masking and transforming it until it becomes highly abstracted and divorced from its purely physical quality. Eventually the viewers get so lost in the ornamental design that she forgets a living face is underneath. By hiding the features of the face, the person loses his physical nature and takes on a spiritual role. No skin is showing as if he were wearing a mask—the emblem of his tradition and culture. The red ochre places the tradition of the Kikuyu tribe at the forefront of the photograph. The person’s intense stare heighten the emotion of the photograph. He looks off the frame, but the blurry background hides the object of his gaze. Lafforgue draws the viewer’s attention to his eyes, but they are hidden under heavy lids and red ochre; the dark recesses are more like the eye holes of a mask than the eyes of a man. Tension arises between his mysterious stare and the uninhibited looking of the photography’s viewer. The Kikuyu man’s disembodied head becomes a mask, an object of his culture that Lafforgue implements to forge an emotional connection between the Kikuyu tribe and their global audience. By doing so, Lafforgue calls into question the meaning of tradition—is it still the same now as it was in the past, or is it now reduced down to this objectified display? In this way, the face paint becomes a highly prized work of art, a beautiful cultural creation with the same amount of value as a western painting in a museum. I’ve seen a lot of hyper-realistic paintings and drawings that look like photographs, but this is an interesting inversion – a photo that looks like a painting! I like how the photographer focused exclusively on his subject’s face to deepen the viewer’s connection with the man in the photo.